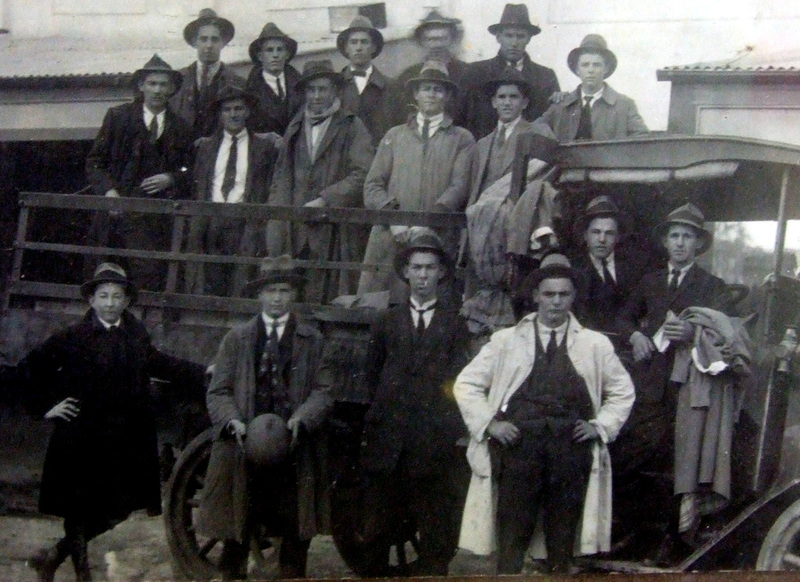 The objective of this blog is to improve understanding of the importance of the Maher Cup and rugby league football generally to the life and history of twelve towns of the NSW south west slopes and northern Riverina – Tumut, Gundagai, Cootamundra, Harden-Murrumburrah, Young, Junee, Temora, Barmedman, West Wyalong, Cowra, Grenfell and Boorowa. All had victorious Maher Cup teams. The period of interest is from the end of the Great War to the 1960s. 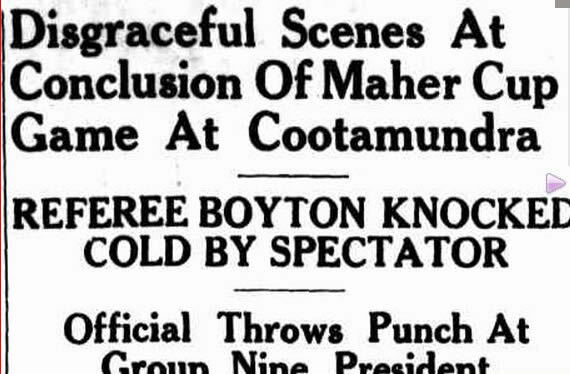 The Maher Cup was simply different to other rugby league competitions. It permeated deep into the psyche of the citizens of these towns. The events around it were dramatic, the passions deep – it was about much more than football. For an introduction to the Maher Cup see the Wikipedia article that I wrote. Hughes, Brian (2010). The Famous Maher Cup: the Final Years. Sheehan’s book (with Brian Hughes’ additions) is the most comprehensive work. 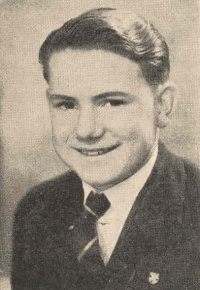 Sheehan was a correspondent for the Temora Independent and principal of Barmedman Public School. He does give extra weight to those towns. Also as he died before publication the work is incomplete. The first attempt at a published history, other than brief summaries in local newspapers, seems to have been 2LF’s History of the Maher Cup published at the start of the 1940 season. It is out of copyright and reproduced here. There is also a chapter titled ‘The Maher Cup: rabbits, floods, fights and fire’, in Ellicott, John (2014). Uncommon Heroes: The hard men and raw talent that built Rugby League. In other chapters he provides detailed information on players Eric Weissel and Tom Kirk. Campbell, Peter (2011). 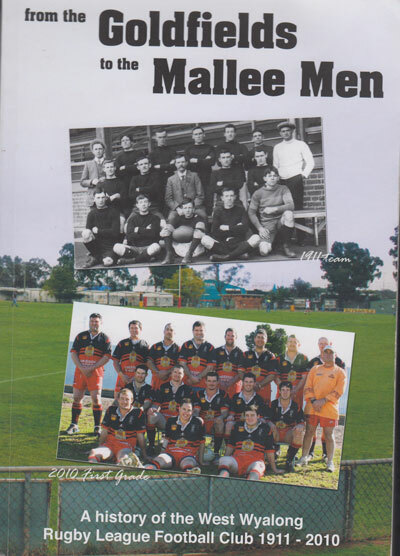 From the Goldfields to the Mallee Men: a history of the West Wyalong Rugby League Football Club, one hundred years – 1911-2010. Ryan, Bede F & Grosvenor, Ron (2011). 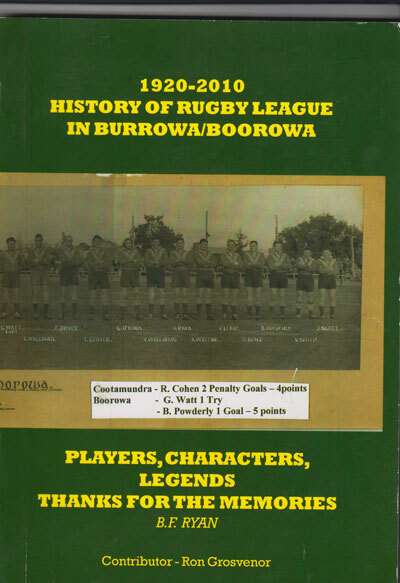 The history of Rugby League in Burrowa/Boorowa. Another relevant work is Weeks, Jack (2009). The breakaway of the Murrumbidgee Rugby League : the forerunner and the aftermath 1960 – 1972. No comprehensive history that places and explains this phenomenon within the social life of the area has been written. I am hopeful that this blog may be a starting point, and that you will share your thoughts and memories for publication. Together we can throw new light on the history of our places. While I live in Sydney, I was born at West Wyalong, in 1952. We farmed “Mallee Vale” outside Wyalong (‘Toppy’), later moving to Caragabal. My father, originally from Tallimba, retired to Young where many relations have lived. He died in June 2014. Memories include late nights after long car trips back from far away towns like Gundagai and Tumut; my first traffic jam when returning to Wyalong from a match at Barmedman – probably in 1961; listening to the warm-toned calls of our radio friend John O’Reilly on 2LF; and playing with little talent as a teenager for Grenfell, where I attended high school. I particularly remembered playing at Young in a match in which I first both observed the falling of snow and questioned why anyone would play this game. In late 2013 the hero from my school days Ron Crowe passed away and the memories of the era seemed to be fading. I decided to attempt to revive the memory. There are thousands care for me. That is what I’m told. Like a dog at Gundagai. By the team that played the best. Just a little cup like me. 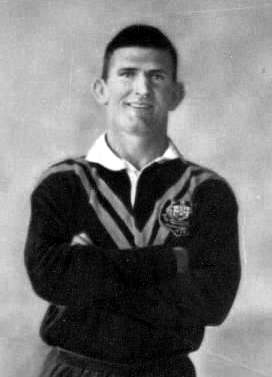 Ron ‘Dookie’ Crowe of West Wyalong, South Sydney, Australia. Thanks John. I will look forward to buying and reading a copy. Cheers, Neil. Thanks so much Robyn. When writing the Wikipedia article on the Maher Cup I made a list in the article of those who could best be described as the most notable Maher Cup players. Bernie Nevin of course is included. He is well documented in Paul McCarthy’s book on Harden and the Maher Cup. 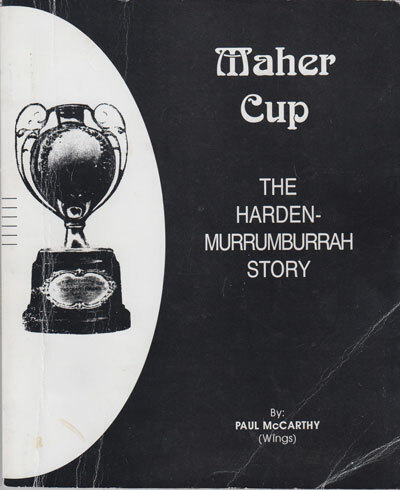 I need to expand my coverage of the Harden-Murrumburrah team of the late 1950s and early 1960s – the most successful in the history of the Maher Cup. Regards Neil. So glad I found this website, my grandfather and his brothers often talk about playing in the Maher cup when they were younger. Its good to finally read something about it. I think they played for Barmedman or maybe Quandialla? Hi, do you know where I can by a copy of the famous Maher Cup The final years by Brian Hughes. I can’t find it anywhere. Hi Andrew. When I last looked they were available at the Tourist Information Centre at the Museum in Temora. 6977 1291. 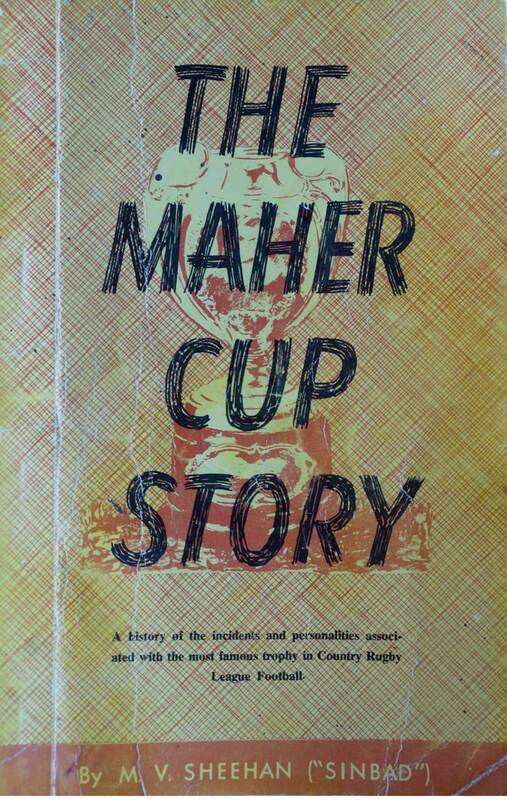 The Maher Cup book was written by M.V. Sheehan and published by Bradley’s (the publishers of the Temora Independent newspaper) back in 1963. So it’s as rare as hen’s teeth. However Brian Hughes at Temora with Bradley’s have basically republished it recently with added information by Brian to cover the final years to 1971. When I last looked this was available at the Tourist Information Centre at the Museum in Temora 6977 1291. If no luck there contact me again and I’ll explore other avenues for you. Hi Peter. Sorry I can’t find any reference in the Maher Cup books. The local history “Cowra on the Lachlan” edited by Joan Marriott has a little information on Cyril Treasure (who I assume is his father) and Roy Treasure who as you will know was a prominent boxer. I will probably have a digitised newspaper clipping or two of games he played in on file. Would that be useful?. Thanks Melissa. Yes I must get a Facebook page organised in the next week or so. I’ve just finished the players list so I’m on for the next job. Your grandfather lead a most successful team at Wyalong and was I think club secretary for many years after he retired. Just today I read an interesting account of Bill Brogan and George Broad from the 1920s – they really didn’t like each other. I’m also a bit fascinated by Baden Broad. I was born at West Wyalong and grew up there at ‘Toppy’ in the Ron Crowe, Steeles and Pilon era of the late 50s/60s. The Broads I remember as a dedicated football family, a tough lot. When someone had the name Broad you knew they must have played or closely followed football. They seemed to marry into other football families…Castles, Lemon, Cafe etc.. Anyway thanks again Mel. no worries…let me know with a reply when you get the facebook page going…i will be able to share to alot of west wyalong people…have have heard in the past some stories about the brogan broad rivalry..my nan is still in ww and sharp as a tack..i am going to show her this site next time i am there … she might have some stories….hahaha funny you say ‘tough lot’ thats exactly what everyone says..especially about Pop Broad (george)!! Thanks to Melissa Zeiher I have also been introduced to your site. I am married to Vicki Broad, daughter of Reg, granddaughter of George, niece of Pat Farrell, niece of Bill Kirkwood, niece of Darrell and on and on goes the list. Will be interested to follow your site and Vicki will probably have some stories to tell. Will keep in touch. Cheers Paul. Great Paul. Broad stories would be wonderful. My father played for Tumut Rovers and Tumut Newtown in the 40’s. Just wondering Neil were these teams part of the Mayer Cup also? I’m not sure Grant. 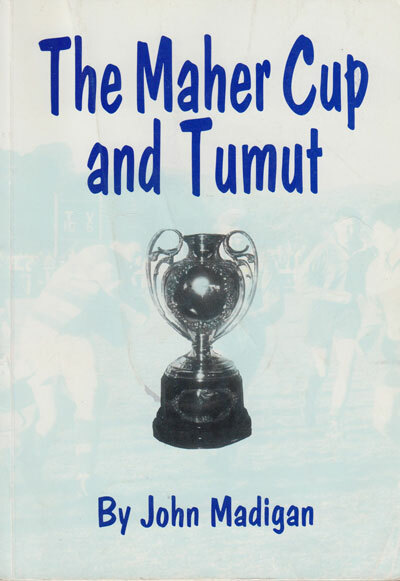 The Tumut Maher Cup team disbanded at the end of the 1940 season – not sure whether through patriotism or lack of players due to the war enlistments. Three players joined Gundagai in 1941 and they made the difference to allow the Tigers to win the Cup. Tumut Rovers (which had been an old union club back 40 years before) came into being during the war years, when there was no Maher Cup. I think they disbanded after the war. Newtown seemed to exist as a local club after the war for a few years. I’m not sure whether they would have contributed to the Maher Cup teams. There was a regular Group 9 first grade comp. with Tumut playing, so I suspect Newtown would jut have played in a local comp say with Tumut Plains, Adelong and maybe Batlow, Gocup, Brungle or whatever teams may have been formed then.